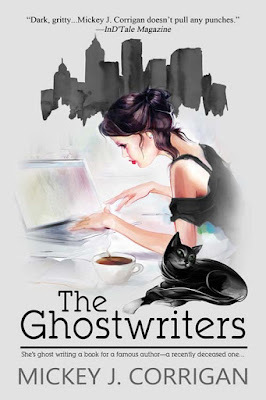 Fabulous and Brunette: The Ghostwriters by Mickey J. Corrigan - Book Tour - Review - Giveaway - Enter Daily! The Ghostwriters by Mickey J. Corrigan - Book Tour - Review - Giveaway - Enter Daily! Hey lovelies! It gives me great pleasure today to host Mickey J. Corrigan and her new book, “The Ghostwriters”! For other stops on her Goddess Fish Promotions Book Tour, please click on the banner above or any of the images in this post. Be sure to make it to the end of this post to enter to win a $25 Amazon or Barnes & Noble Gift Card. Also, come back daily to interact with Mickey and to increase your chances of winning! There is no glitz and glamour in this book. The author, Mickey J. Corrigan, tells it like it is and doesn’t hold back. Jacy’s life is not pretty; but with each page we delve deeper into her issues and leave with a better understanding of these complicated layers. I loved how descriptive this book was written. There was such detail that it was easy to picture the scenes and locations. I have never been to NYC, but after reading this book it was hard not to feel like you were actually there watching the story unfold. I loved the mystery and suspense of this book and found myself sitting on the edge of my seat waiting to see what happened. This book was very engaging and filled with so many different dynamics that it kept you fully entertained the whole way through. I would absolutely recommend this book to anyone interested in an exciting, intriguing, edgy, psychological book filled with grit, mystery, humor, suspense, and so much more! This book sounds lovely. Thanks for the chance. I enjoyed following the tour and learning about The Ghostwriters, Have a wonderful holiday season!